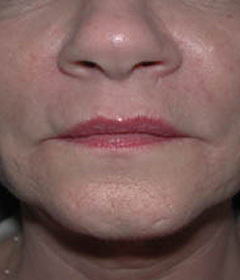 Wrinkles and acne scarring around her chin gave this 55-year-old woman a prematurely old, worn appearance. When she came to our office for her BOTOX® Cosmetic consultation in St. Louis, Missouri, she explained that she wanted to smooth the area around her mouth and correct the acne scars that gave her skin a blotchy texture. We recommended a series of treatments beginning with the Obagi® skin care regimen to stimulate her body to renew the skin cells naturally. Then, she underwent a series of six microdermabrasion treatments to remove dead skin cells and encourage her tissues to firm and smooth her skin more effectively. BOTOX® Cosmetic smoothed out the most obvious lines between her eyebrows, and Restylane® dermal filler was placed in the nasolabial folds, the vertical lines above her upper lip, and the creases on her chin. 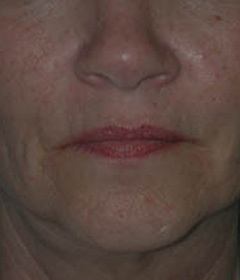 After her series of procedures, this woman's lower face looks much smoother and younger. The BOTOX and Restylane very effectively eliminated the wrinkles, and she is enjoying great results from the Obagi treatments. Where her skin had puckered around her wrinkles, we now see smooth tissue with a much more even and healthy tone that matches the rest of her face. Although she did not undergo any St. Louis cosmetic surgery procedures like neck lift or face lift, her healthier skin elasticity has also improved the look of her chin line.